Killing time before tae kwon do class, Kristin and I wandered into a cute new Asian store in Moabit. It had a lot of great stuff, including a small collection of nice looking fresh produce. In the spirit of supporting this new venture, and because I can’t stop myself when I see them, I bought a couple jars of Patak’s: Hot Mixed Pickle and Tandoori Paste. 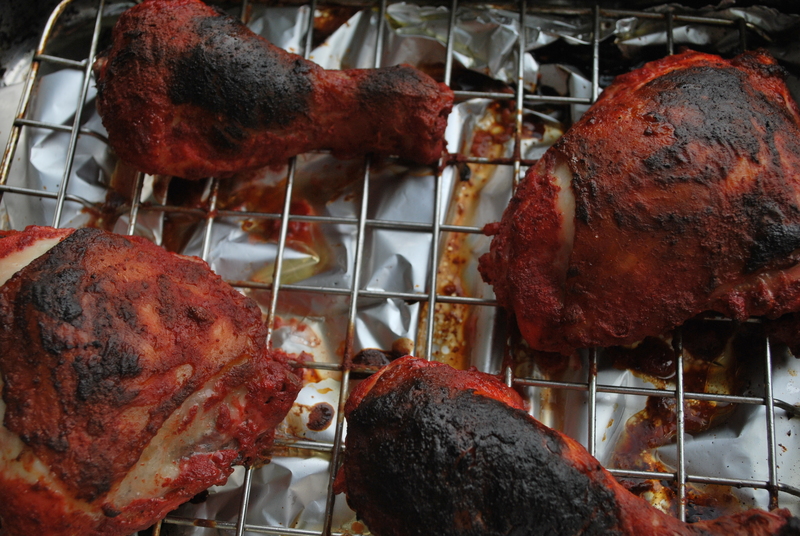 I love love love grilled chicken — tandoori chicken included — but I’d never used the tandoori paste before. Years ago, I once made a cheater version from scratch that was acceptable. The marinade doubled as a dressing for a salad of grilled chicken strips on arugula. (Important! I set aside some marinade for dressing. Never eat used marinade uncooked, of course.) Tasty, but even that cheater version had a lot of ingredients in it, and it was really pale — barely yellow. I used to feel bad about just buying pre-made paste for curries instead of making them from scratch, but then an Indian room mate told me that Indian people just use Patak’s. And so it was without guilt that I popped the freshness seal and scooped out some paste. Swirl with yoghurt and voilà: tandoori marinade in 10 seconds. Suitable as lunch for one; MAYBE two if you serve something besides chicken. I marinated the chicken overnight with plans to have it as my lunch. I intended to make a side, but got distracted while the chicken was cooking. So juicy. Perfectly cooked. The yummy juice burst out of the meat and it was all I could do to lick it up before it dribbled away. I ended up devouring all the chicken while standing over the oven. As a complete afterthought, I ate some pickle. It was great too. People ask me for this “recipe” every time I serve chicken parts. Today, I used this same method, but I marinated the chicken in the sauce overnight. I also didn’t bother turning it, since I put the chicken on a rack instead. Dead easy. I recommend this recipe to everyone I know who is anxious about cooking raw meat. If you’re really grossed out by even slightly bloody meat or are afraid that you’re going to undercook it, I recommend using dark meat and cooking it 10 minutes longer. Dark meat will stay moist and yummy even if you overcook it a bit. Position a rack in the centre of the oven. Place chicken in a shallow roasting pan, brush with two-thirds of the sauce and arrange skin side down in a single layer. (Tip: line the pan with tin foil first. You’ll really save yourself a lot of work cleaning the damned pan afterwards). Bake for 20 minutes. Using tongs, turn the chicken skin side up. Use the back of a spoon to spread on the remaining barbecue sauce and bake until the dark meat pieces exude clear juice when pricked deeply with a fork, about 20 minutes more. 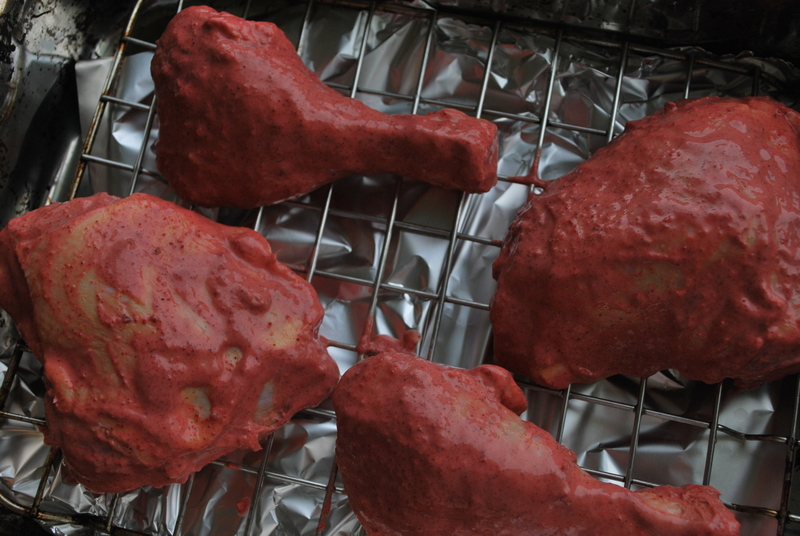 If you wish to crisp and colour the skin, run chicken briefly under a hot broiler. 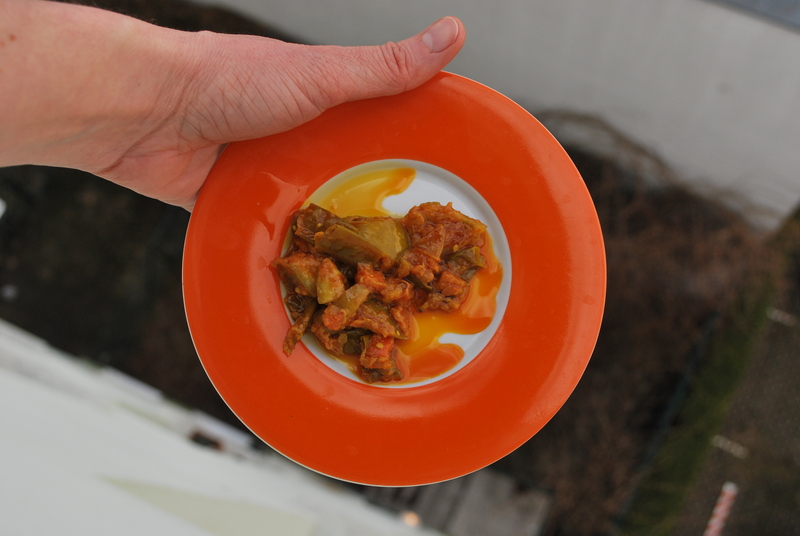 I believe my brother-in-law Gabe has a recipe for hot Pakistani mixed pickle. I’ll see if he can find it and will let me post it. Love that you’re holding your plate out your window to get better light! The chicken looks really delicious; if it was anywhere near as good as your oven-barbecued chicken with bbq sauce I’m sure it was. Sadly there is no pickle recipe. Just pickle memories. That second one is how Andrew makes chicken almost every time. It is tasty, especially the dark meat. Even I can make it! It’s really more of a method than a recipe, and yes, truly an easy path to tasty perfection.